1 boudin noir (typical sausage from Aosta Valley is one of the great classics of the traditional gastronomy of Val d’Aosta and is still to the present day prepared closely following ancient recipes inherited from generation to generation. This particular sausage is produced with boiled potatoes, hand peeled and left to cool, to which the following is added: lard cubes, beetroot (excellent natural preservative), spices, natural aromas, wine and beef or pork blood. The mixture is made into sausages within thin natural casings, hand tied and hung to dry for a couple of weeks. 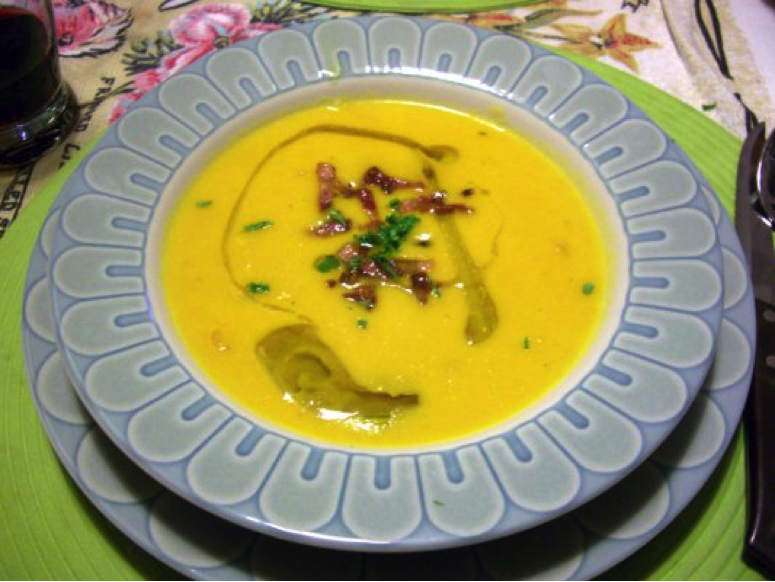 Considered at one time a food of the poor , today it is one of the most characteristic foods on the tables of Val d’Aosta. Served as a cold entrée, or boiled together with red mountain potatoes; alternatively, if cooked in the oven for about 15 minutes, when still fresh, is considered a true delicacy also for the most refined palate. Fry the onion with a little extra vergin oil, add the yellow pumpkin, the clear broth and cook, fixing with salt and pepper. In the meanwhile make a fonduta putting the fontina cheese in the milk, when the fontina cheese melts, take out from the fire and add a yolk, mixing powerfully. Something more precise about the (not easy) preparation of fonduta: dice the fontina and put it in the upper half of a double boiler with the milk; seasoning the mixture with a pinch of salt and let it sit for about an hour. Then heat it gently, stirring with a whip, until you’ll obtain a dense, cheesy cream. At this point incorporate the yolks, one at a time. Keep it hot. Then, put the cubes of blackbread in the oven to crisp them well, the bread has to be very crispy. In the meanwhile cook the boudin in a nonstick to make it crispy too. Then put the pumpking cream in a dish and put in the middle of the cream a spoon of fonduta drawing a decoration as you like, crumble a little of boudin on and garnish with some croutons of black bread.